This frog does not call. Background: The two living species of Tailed Frogs of the Pacific Northwest (Coastal Tailed Frog and Rocky Mountain Tailed Frog) are primitive and highly unusual frogs, most closely related only to another small group of primitive species known as New Zealand Frogs. Tailed Frogs are highly adapted to life in fast flowing, mountain streams, most notably in the development of the male intromittent (copulatory) organ, the cloacal “tail,” instead of external fertilization, which is typical of other frogs. 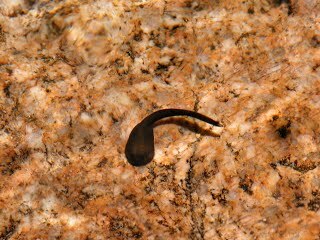 After copulation, sperm are stored for about a year before egg-laying occurs. 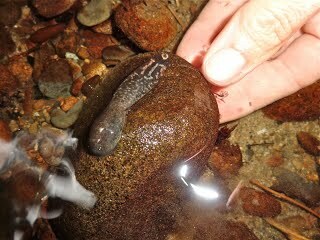 Other stream adaptations include lack of an eardrum or voice (both impractical in the noise of a fast-flowing stream), lungs greatly reduced in size to minimize buoyancy, sensitivity to warm water conditions, and highly specialized tadpoles with a sucker-like mouth. 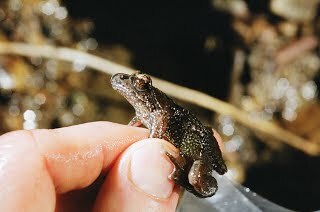 The Coastal Tailed Frog is associated with forested sites and often declines where logging practices increase stream temperatures and siltation. 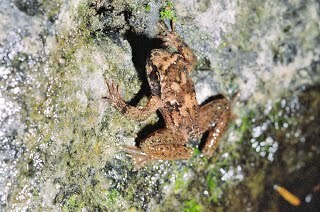 Juvenile and Adult Description: Coastal Tailed Frogs are small (body length usually less than 2 inches), with relatively large heads and long legs. The body shape is somewhat flattened. The pupils are vertical (like a cat’s), an adaptation for vision under low-light, nocturnal conditions, when adults are most active. The outer toes on the hind feet are flat and wide, whereas the front toes are hard and claw-like to facilitate crawling in flowing water. Males are smaller than females and easily identified by the “tail.” Coloration is gray, brown, or reddish brown and may be mottled. The skin is glandular (bumpy to grainy). 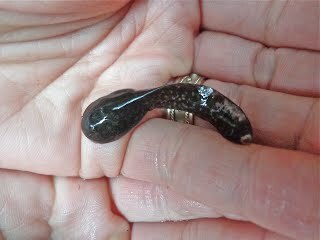 Larval Description: Tadpoles are dark reddish brown to black, and may have mottled tails. 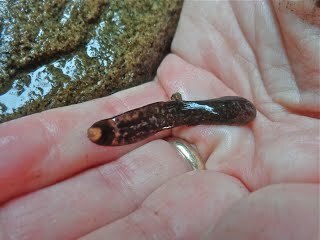 A white spot at the tip of the tail is an apparent anti-predatory adaptation to draw the attention of a fish or Giant Salamander. The body is flattened (viewed from above). The dorsal fin is low and streamlined. The most unique feature is the large oral disk, with a large mouth and prominent tooth rows surrounded by a sucker-like structure. 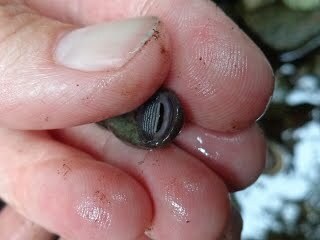 Coastal Tailed Frog tadpoles adhere to rocks using this oral disc and feed by scraping diatoms. 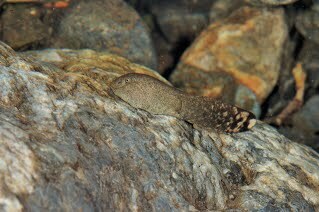 Although capable of swimming, tadpoles more often move by slowly creeping against the current while attached and may be observed hanging on steeply sloped, even vertical substrates with water flowing over them. 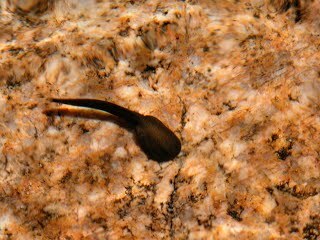 Tadpoles are slow-growing and often do not metamorphose until the second or third year, although the larval period can range from one to five years, depending on water temperature, elevation, and food supply. Eggs: Rarely observed, the egg masses are laid in June or July attached to the undersurface of large rocks and resemble a string of white pearls within clear jelly. The eggs are large (5 mm diameter). Hatching occurs in late summer or autumn. Habitat: Occurs in fast-flowing, permanent forest streams, including headwaters with clear, cold water and cobble-boulder substrates. 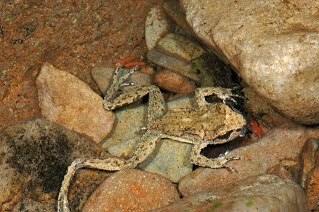 Highly sensitive to desiccation, Coastal Tailed Frogs are most often observed along stream banks at night and during wet weather, and may also be found by turning rocks in or near the water. Overland dispersal has been documented. Come learn about the Federally Listed Oregon Spotted Frog and how you can get involved. We have a Training for potential volunteers coming up on March 16. Click Here and find out more. We are joining the iNaturalist band wagon. This nifty app allows you to add data directly from your smart phone (or computer). It does more than just amphibians as well. The data joins an international database and makes it sooo much more useful. Check it out and start mapping frogs (and salamanders). Learn more in the “Data Input” tab on our website.